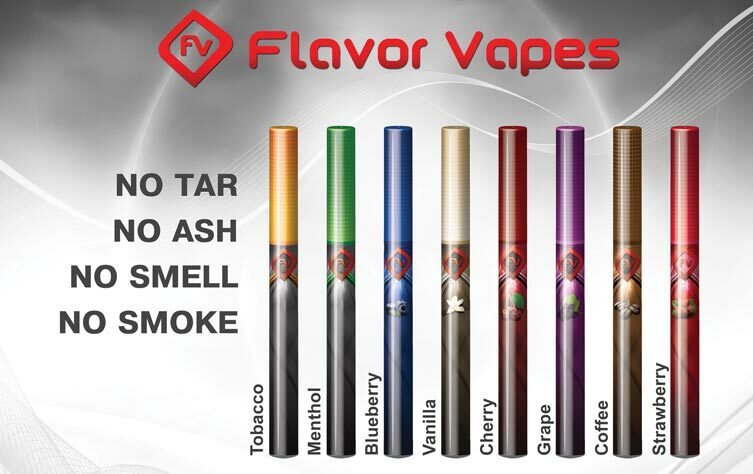 Flavor Vapes is a dedicated disposable smokeless cigarette line, meaning they only offer disposables. These disposables are produced by UTVG (United Tobacco Vapor Group), the same manufacturer that produces a total of 4 electronic vaping product lines, including popular Premium Vapes Smokeless Cigarettes. 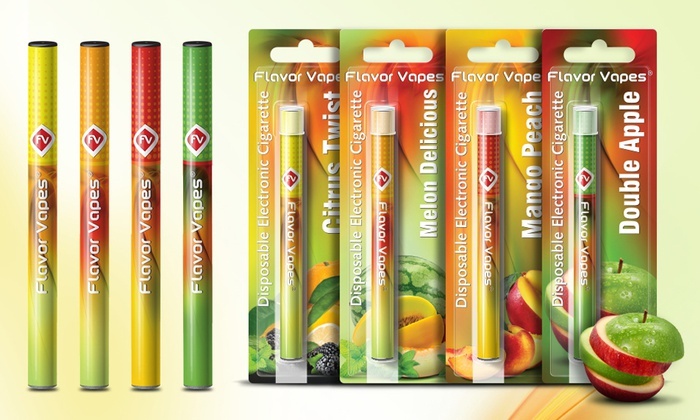 Flavor Vapes offers a variety of different flavors in a disposable e-cig format, making it one of the stronger disposable electronic cigarettes available. The variety of flavors also feature matching colorful designs and LED colored tips. The Flavor Vapes really look fresh and come in traditional e-cigarette flavors as well as e-Hookah flavors. What are E-Hookah flavors you ask? Well they are the same disposable e-cigs, but in popular fruity Hookah flavors. A flavour trend that has gained ground and demand among the vaping community. Flavor Vapes try to give you a good disposable option with plenty of flavors and specialized electronic hookah experience. Here’s what we think after trying them. The Flavor Vapes Disposables are rated for 500 puffs and they do pretty well. All depending on how much and how long you puff for, they should last for more than 400 puffs. Vapor amount is not very high, but still gives a good throat hit. The vapor amount and thickness is a medium-high throat hit, gentle but not completely subtle. The vapor is just strong enough to bring out the e-liquid flavor. Some of the flavors we’re really good. Myself and friends really enjoyed the E-Hookah Fruit flavors best and think they did come close to having a similar hookah or shisha smoking feeling. Being someone that smoked hookah tobacco for a few years, I was drawn right away to this product. Our other reviewers preferred some of the more common e-cig flavors available. I wish they would produce more vapor to really resemble puffing on a real hookah, but these hit the mark as far as disposable electronic cigarettes go. They will be enough of a throat hit for those who don’t want a very strong e-cig, but the downside remains the limited nicotine strengths. As far as design goes, it’s similar in size and weight to most brands, but as opposed to looking like a traditional cigarette, the colorful wrapping matches the flavor choice. Although I did get a single dud so far, quality has remained consistent. All the flavors with the exception of the e-Hookah ones come in 18mg or 1.8% nicotine volume. 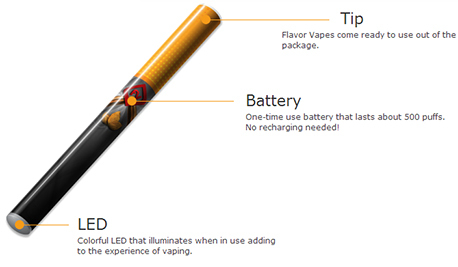 The e-Hookah line is offered in 6mg or 0.6% nicotine volume only. Possibly due to keeping the strong fruit flavorings, they chose to keep low nicotine volume with the e-hookah line. However, for a disposable electronic cigarette that is trying to promote disposables only, we would have liked to see more options on the nicotine volume, as well as a 0% option for those trying to reduce or quit nicotine all together. To quickly go over the extensive flavor options, the tradition flavors are; Tobacco, Menthol, Blueberry, Vanilla, Cherry, Grape, Coffee and Strawberry. The new e Hookah line offers Double Apple, Mango Peach, Melon Delicious and Citrus Twist. 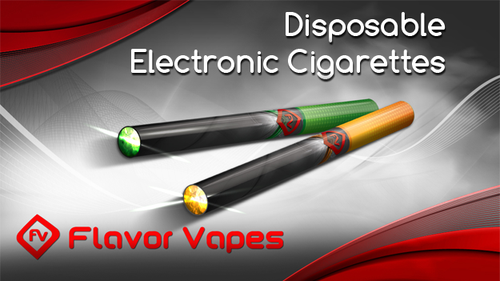 All the flavors cost the same price, being $9.99 per Flavor Vape disposable electronic cig. 500 puffs is the equivalent of about 2 packs of cigarettes, which makes this a fair priced disposable, but in the long run, you can save more money with rechargeable starter kits. Overall the Flavor Vapes offer exactly what their name suggests. They give the consumer a huge variety of choice in different tastes, but are not a complete solution for the everyday user. Anyone who vapes regularly after switching from smoking, knows that it takes a high quality electronic cigarette that is customizable to the user’s needs to satisfy cravings on the long run. Additionally, disposables, although not very expensive, come out much more costly than rechargeable and refill-able starter kits in the long run. We do give it to them for providing something different and better in the disposable smokeless e-cigarette world, being a wide variety of flavors including an e-hookah inspired line, which I hope to see more flavors for. Flavor Vapes are great to try and share with friends, gift idea, or just to try vaping for the first time. I will continue purchasing them from time to time, but if you are looking for an everyday electronic cigarette, head to our full review list to find the top e-cig brands available today.